second-longest arch in the world. 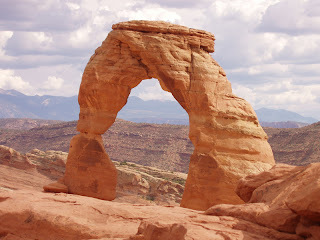 Arches National Park contains more than 2,000 natural stone arches—the greatest concentration in the world. But this pales in comparison to the grandeur of the landscape—contrasting colors, textures and landforms unlike anything else on the planet. Located above the Colorado River in southern Utah’s high desert, the park is part of an extended area of canyon country, sculpted by millions of years of weathering and erosion. 300 million years ago, inland seas covered the region. The seas filled and evaporated—29 times in all—leaving behind salt beds up to about 4,000 m thick in places which is known as the “Paradox Formation” today. Later, sand and material carried down by streams from the surrounding uplands buried the salt beds beneath thick layers which later became cemented into rock. Most of the formations at Arches are made of this red Entrada sandstone and tan Navajo sandstone that was deposited 150 million years ago. 2,000 arches in the park. The salt beds, under tremendous pressure from the weight of the overlying sandstone, became unstable and began to flow. This movement caused the overlying rock to move and buckle. Some sections were thrusted upward into domes, while other sections dropped into the surrounding cavities. Vertical cracks developed which would later contribute to the creation of arches. As the movement of salt deep underground shaped the surface, erosion carried away the younger layers of rock. Water seeped into the rock through cracks and washed away loose material and eroded weaker portions of the sandstone, leaving a series of free-standing vertical fins. Ice formed during colder periods would expand and put pressure on the rock, breaking off chunks and created openings. Many of the fins collapsed, but some that were harder and more resistant to the erosion survived to become the spectacular stone sculptures that we see today. Although the park has timeless beauty, it is not indestructible. The same powerful forces that nature harnessed to carve these extraordinary arches will eventually tear it down. Wall Arch, a photographer’s favorite that was ranked 12th in size, collapsed in August 2008. Landscape Arch, which at 88 m is the longest arch in the park and the second-longest in the world, is facing a grim future at the destructive hands of gravity and erosion. Since 1991, three slabs of sandstone have fallen from the thinnest portion of the arch and the park has had to close the trail which passes beneath it to protect visitors from its eventual demise.